I read this back in 2006 and wasn't really impressed enough to keep going. I've heard so many good things about the series, though, that I wanted to give it another try. My 2006 self, which was pithier (ugh) and briefer (maybe not the worst sin) saw this as a typical shojo girl with issues sharing a name with an unusually confident shojo girl, and what was sure to be their inevitable meeting. I had been reading this when I was able to get Shojo Beat regularly (yes, I used to read Shojo Beat) and it just didn't grab me. Re-reading it, I think there's a bit more to the story than I gave it credit. The non-confident Nana is struggling with the same issues many people are at her age (and some well into their adulthood), trying to juggle having fun with putting together her future. It's time for her to either stay home or move. She sees Tokyo as a way to get a fresh start, yet keeps her ties to her past via a long-distance relationship. Things are bound to stop working for her, and seeing that crisis should be interesting to follow. 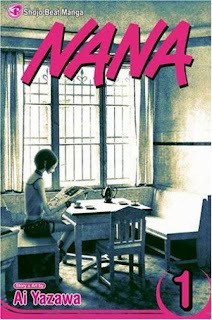 On the other side (and part of me wishes they'd published this as a flipbook), rocker Nana already has had the harsh breakup, which her part of volume one recounts. She's already faced her worst fears and now, after recovering, is looking to go to Toyko, too, not to find her way, but to prove that she can make it at the life she's chosen--a singer. Their lives are fairly similar, though at different points. That's what's going to make their inevitable meeting interesting. At least, that's my guess as to part of why so many people like this series, and I am hoping to see what they see once I get there. Sometimes you have to step away from something and look at it with fresh eyes. That may have helped here with Nana, and I'll be curious what I think of the next volume.